The Dangers Of Dope-Smoking Ascetics in Kathmandu : NPR Public Editor A newscast report designed to give a break to the papal coverage instead offended Hindu listeners. The complaints underscored the danger of being tempted by exoticism. The sirens here were naked Nepalese ascetics smoking weed. 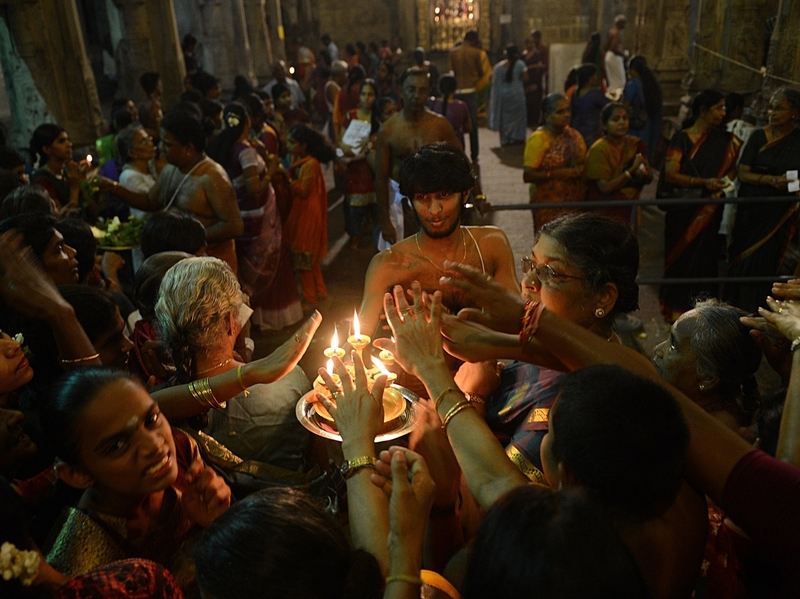 Sri Lankan Hindus receive blessings from a priest holding an oil lamp during the Maha Shivaratri festival at a temple in Colombo on March 10, 2013. It was a short comment stuck in the middle of a 13-second item in a 10 a.m. hourly newscast. The editor said the purpose was to give a break to the intensive coverage of the search for a new Roman Catholic pope, who had not yet been selected, by giving attention to another of the world's great religions, Hinduism. Many Hindus, however, were neither appreciative nor amused. "The biggest annual religious event in Nepal is underway," intoned anchor Paul Brown. "A stream of pilgrims passes by naked ascetics puffing on cannabis pipes. The Shivaratri festival brings an estimated one million Hindus to an ancient Kathmandu temple each year." To some Hindu listeners, the story trivialized the tradition. By placing so much emphasis on the naked ascetics smoking dope, one assumes that this is a central part of the festival. It is not. The ascetics and the marijuana are a small sideshow, according to the letter writers, the Hindu American Foundation and online research done by intern Kiran Alvi. "As an American Hindu, I found your story this morning on Shivaratri unspeakably offensive," wrote Terence Coe of Stamford, Conn. "Shivaratri is one of the most sacred events of the year for Hindus who worship the Lord in the form of Shiva, and is marked by prayer, fasting, and celebration of the Lord's glories. Your dismissal of it as a bunch of people gathering to watch naked men get stoned is so foul that I have no words for it." Hindus, who make up the world's third largest religion, celebrate Maha Shivaratri, one of the religion's holiest days, in February or March, depending on the community. They celebrate it everywhere, and not just in Nepal. According to Jay Kansara, associate director of the Hindu American Foundation in Washington, D.C., observers keep fasts; gather at temples; practice yoga and meditation; and hold night-long vigils, chanting sacred texts and offering prayers. He said that the story "trivializes" the tradition and was "sensationalist journalism." I've talked to our anchor, Paul Brown. First of all, we apologize to anyone who took offense from the story because our intention was quite the opposite. We have been doing so much coverage of the Papal conclave that Paul wanted to remind our audience there are other major religions out there and that some of them are celebrating and honoring significant dates on their calendars. In describing one small aspect of the Hindu observation of Shivaratri, we did not mean to imply that was the extent of the rituals or in any way, cast aspersions on those who practice the religion. It was, in fact, an effort to share with the listening audience the diversity of religious expression in our world. We regret and are rather shocked that our effort in that regard was so hurtful to some, but I completely understand the sensitivities involved. We certainly never meant to be disrespectful to practitioners of one of the largest religious faiths on the planet. For what it's worth, Paul was so intrigued by the events in Nepal that he posted some incredible, beautiful photos from the Shivaratri observance on his Facebook page to which he received many positive responses from friends and colleagues who were learning of it for the first time. In other words, a mistake was made. As the number of Hindus expands in the United States and India grows as a global power, we who are not Hindus will surely be learning more about a religion that for most Americans remains exotic, whatever it is that a handful of Nepalese ascetics do.